Diamond SWR/POWER meters are of the highest quality. Measurement accuracy is between ± 5 to 10% depending on model. 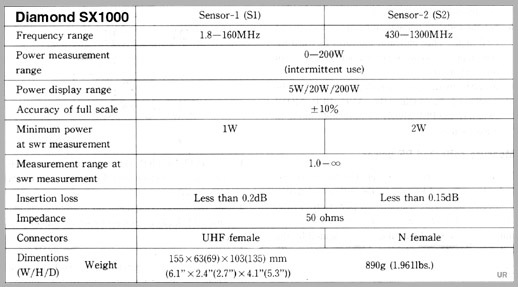 Insertion loss is typically less than 0.15 dB. 12 VDC at 50 mA is required for illuminated display. Models SX-600 and SX-1000 have dual sensors on the back panel (one for each range). The Diamond SX-1100 has the sensor switch on the back panel. Power capacity indicated is for intermittent use.